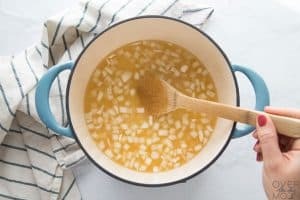 This soup is a favorite during Fall, Winter and Spring for my family! Even my pickiest eater loves it! 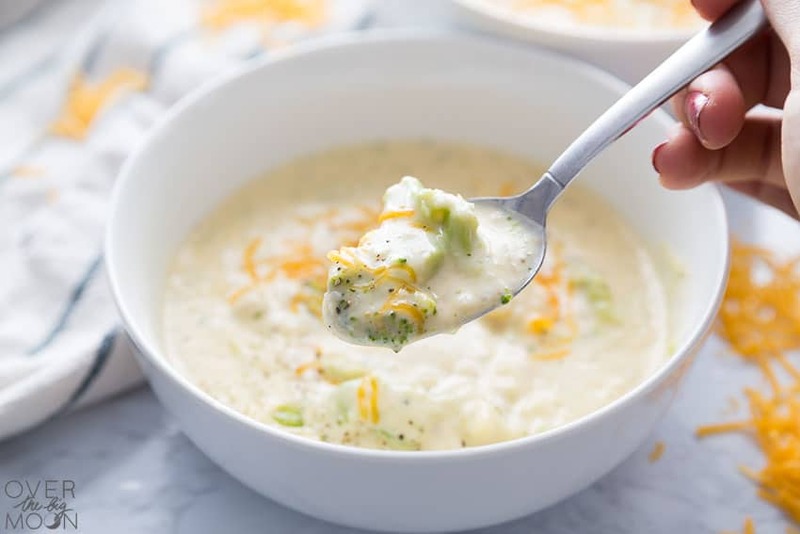 It’s got a thick creamy texture, with chunks of vegetables in it! 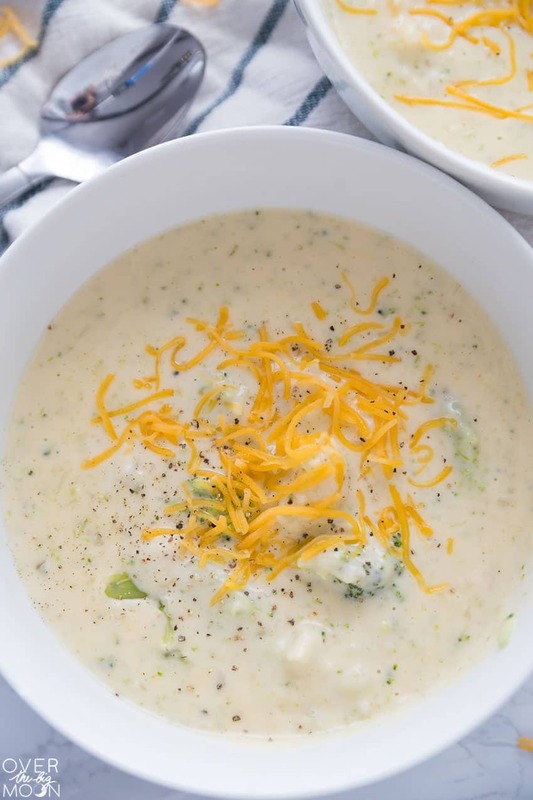 This Broccoli Cheese Soup is the BEST! It's creamy with chunks of vegetables that help create the perfect texture!! Simmer chicken broth and chopped onion for 15-20 minutes in a covered small saucepan, until onions are soft. Heat milk in microwave for 1-2 minutes. 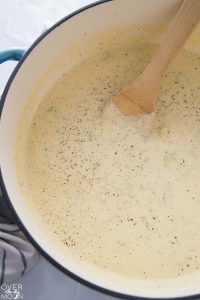 In a separate medium-sized stockpot, melt butter then add flour and pepper. 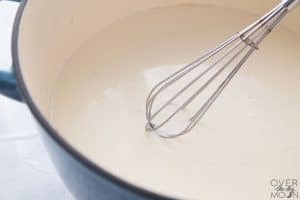 Cook together for a couple of minutes, then whisk in warmed milk. 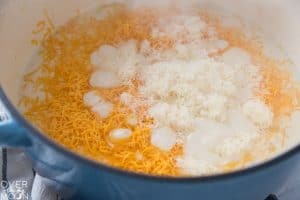 Stir and heat together on medium-high heat until soup starts to thicken. Next, add chicken broth and continue to stir until well blended. 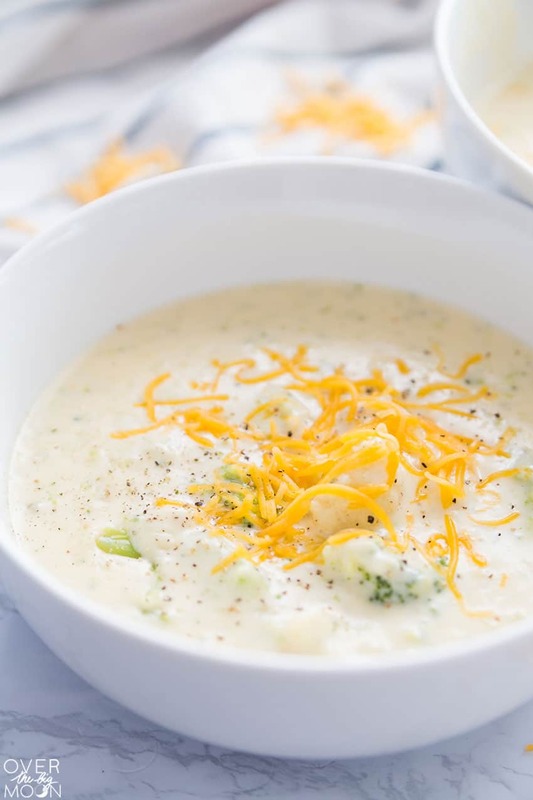 Add cheeses and steamed broccoli and cauliflower. Serve immediately. 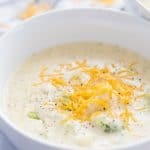 You can freeze Broccoli Cheese soup, but it is a bit trickier. Because of the dairy base, when it freezes, it can separate into watery layers. But, don’t stress, this will remedy during the reheating process. Before freezing, make sure to cool the soup to room temperature. Put the soup in an airtight container, leaving room for the soup to expand when it freezes. If you want to save room, I love using Freezer Ziplock Bags. They can lay flat in the freezer. It will stay good up to 2 months in the freezer. And if you love this post, I’d love it if you’d pin the image below!! This is my favorite soup! I love this recipe so much! This turned out so delicious! This dinner is a total mom win! Love that my kids eat it up and ask for seconds. So glad you guys all loved it! This is our new favorite soup! Delicious, easy and perfect on our recently snowy days. Yay! I’m so glad you guys all loved it! I always crave it on rainy days too! Love to make this when I am low on time to make supper! Plus, the whole family loves it. Yes! It really is so quick to throw together! Thanks for the nice comment!